Description: Suncatcher Surf Shop is a business categorized under clothing-retail, which is part of the larger category family clothing stores. 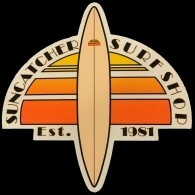 Suncatcher Surf Shop is located at the address 9425 2nd Ave in Stone Harbor, New Jersey 08247. The Owner is Suncatcher Surf shop who can be contacted at (609)368-6131.
Review: Suncatcher Surf Shop is the most traditional surf shop in Avalon & Stone Harbor. We offer high end men and women's clothing and the largest collection of surf boards and gear on the island. Call us at (609) 368-3488 for more info! Location & access map for "Suncatcher Surf Shop"